A Delawarean that made a Difference! As with many others associated with the Underground Railroad, the life of Samuel Burris still holds many mysteries. Born in Willow Grove, Kent County, Delaware in 1808 a free black man, Burris moved his family to the relative safety of Philadelphia. It is from Philadelphia that he would make his trips into the South to free other African Americans from slavery. Burris began his service on the Underground Railroad by 1845. He worked closely with John Hunn to assist slaves escaping from Delaware and neighboring Maryland. 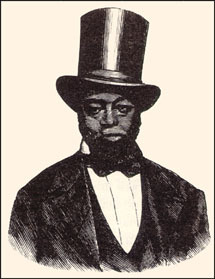 Burris also worked closely with William Still, an African American leader in the Underground Railroad in Philadelphia. Burris knew the risks associated with Underground Railroad and was willing to take them. On one occasion he said, "helping slaves to regain freedom ... in the state of Delaware is a crime next to that of murder, if committed by a colored man." The punishment for an African American caught aiding slaves was severe. Burris could be sold into slavery for a period of seven years. In June 1847 his fears became a reality. He was captured in the act of assisting Maria Mathews, an escaping slave from Dover Hundred. Burris was thrown into Dover jail for ten to fourteen months before his trial. At his trial he was convicted and sentenced to be auctioned into slavery. Unknown to Burris, members of the Pennsylvania Anti-Slavery Society plotted to free their friend. Isaac A. Flint, a member of the society, attended the auction posing as a slave trader. When Burris took his place on the auction block Flint examined him just as he had seen the other slave traders do. Flint performed perfectly, convincing even Burris that he was being sold into slavery. However he saved Burris from the horror of slavery by outbidding the other traders. The bill of sale completed, Isaac Flint and Samuel Burris made a speedy return to Philadelphia. Samuel Burris never again returned to Delaware, remaining in Philadelphia until 1852 when he and his family moved to California. He kept in contact with the Underground Railroad through William Still. After the Civil War ended Burris worked through black churches to raise money to aid free blacks. Samuel Burris died in San Francisco in 1869.